Silk Gel in 250g tamper-evident pot. 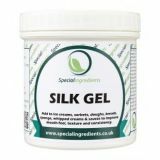 Silk gel is specifically designed for the production of ice creams and sorbets. 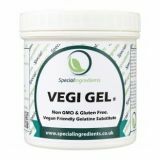 By adding a small amount of silk gel to a traditional base, this will allow the production of silky, soft ice cream or sorbet that is smooth to the pallet. It will also improve texture and consistency, making the finished product easier to serve and store. 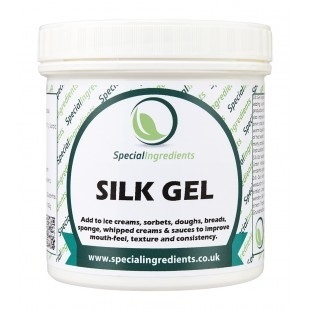 Silk gel is very easy to use and can be easily dispersed into a warm liquid base. If using a cold base, the gel should first be mixed with a drop of hot water. Silk Gel can also be used as an emulsifier and texture improver in many products, such as baked goods, whipped cream and ice cream. Add to ice creams and sorbets to improve mouth-feel, texture and consistency. A small amount can be added to stabilise whipped creams and sauces. Improve the texture of doughs, breads and sponge.